Some families that we support through the difficult time of missing a loved one, decide to get more involved with the charity through events, fundraising and writing. 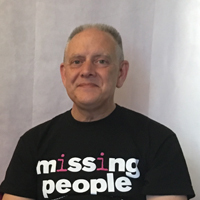 In our latest Facebook Live video, Community Fundraising Manager Bryony is joined by Kevin Gosden, who explains why he has given so much support to Missing People over the last 10 years, since his 14 year old son went missing. Could you tell us about Andrew? Our son Andrew went missing just over 10 years ago when he was 14. He set out from our home in Doncaster on his way to school, but we found out later that he returned home, got changed, got a ticket to Kings Cross, and from that point, apparently disappeared from the face of the earth. Even after 10 years having been through every possible theory we can think of, we still have no idea what prompted him to go missing in the first place, and no idea, of course, what’s becoming of him afterwards. Could you tell me how Missing People have supported you? Early on, very quickly getting a proper missing poster, that you can get printed, was really important. I’ve lost count of the number of times and things we’ve emailed or called about. Obviously liaising with the police, passing on possible sightings is really helpful. There is an online family forum – an opportunity for people to support one another. It does help you feel that there are other people out there who have some idea of what you’re going through and what it feels like. Recently you organised a special fundraising event to mark that really important occasion. In the house there’s no longer somebody listening to music or watching the TV or generally just moving about. There’s suddenly a huge hole there and it seems so much quieter. A lot of people can identify with that sense of there being a gap, a silence when you’re missing somebody. Because it’s been 10 years, I carried out a 10 hour sponsored silence. Which was really difficult! During that time, we also did a bucket collection at Doncaster Station and overall we raised just over £3,000 which absolutely amazed me. Really, it was those lovely, positive, supportive comments that were as important as seeing the amount go up. I turned down as many requests for media interviews as I actually managed to fit in. I hope that raised a lot of awareness, not just about our Andrew but about Missing People more generally. It’s been such a tough time, and still is, you just don’t want other people going through it. What would you say to other family members who are watching and thinking about doing some fundraising? Go for it! It’s not really the amount so much that you raise, although that is important obviously, but it doesn’t have to be a massive or difficult thing. When somebody opens the door for you, you tend to say thank you. It’s like that but on bigger scale. We’ve had so much support, there’s a part of you that wants to say thank you. It is a therapeutic thing to do, even if you’re in the position like us where it’s been years with no answers at least you can say to yourself ‘I’m helping perhaps one other kid not to go missing because I’ve done this newspaper article or paid for a few hours of somebody being on the helpline’. You might not be able to say it for yourself but if its stop that happening to another family, it’s got to be worth it. Technology has changed so much in the past 10 years, how much of a difference or impact has that had for families such as yourself? Quite a big one. When Andrew went missing, Facebook was still a pretty new thing. My brother instantly created a ‘help find’ group. It’s the only reason I’m still on Facebook. But very much that’s grown and been a very useful tool for sharing information, not just about Andrew but about other missing kids as well. This year we launched Find Every Child, of which Andrew is the face of. People will have seen his appeal on billboards and bus shelters all over the UK. I get very mixed feelings when I encounter the posters. I’ve done more radio, TV, documentary, magazine interviews than I can remember. It makes it seem worth all that effort in a way, that he is enough of a familiar face in the UK to use on something like that. More than anything, I hope that lots of people text the number and sign up to give £3 a month. If this helps, great. Bryony: It’s certainly been an enormously successful campaign in terms of raising awareness and funds as well. For us we just want as many people across the UK as possible to see the posters, text in, follow us on Facebook, follow us on Twitter and share the appeals. Like you say, every share, every pound donated, makes a difference and helps us reach more missing people. Our next campaign is #SingThemHome on social media. Our Family Tree is a way of remembering your missing loved one by purchasing a leaf. We also have a page on the website with a list of other ways families can get involved.